I have the perfect dessert recipe for you today – Paleo apple crisp! Get the oven ready and put your apron on. You won’t want to miss out on this recipe. This recipe is the perfect way to use up all the apples from your yard, local farmer’s market or even take advantage of the great prices of apples at the grocery store in the fall! This Paleo apple crisp recipe is buttery, sweet, and crunchy. The arrowroot starch helps the cooked apples achieve a glossy, thick sauce while the honey sweetens it just enough. We served ours with vanilla ice cream and it was fantastic, but a coconut milk vanilla ice cream would be excellent as well. I also love to just pour warm milk or cream over apple crisp too. When I was younger I tried apple pie once and did not like it at all. It was years later my best friend had me try her mom’s “famous” apple crisp recipe, and I LOVED IT! That was when I realized I am an apple crisp kind of girl – but not an apple pie kind of girl. 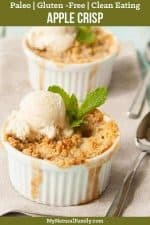 I like how the apple crisp caramelizes and the texture is more appealing to me; the crunchy crust combined with the soft apples is a perfect combination in my opinion. This would also make a good starting point for other crisps recipes, such as strawberry rhubarb crisp or a berry crisp and would taste fantastic in a dutch oven. 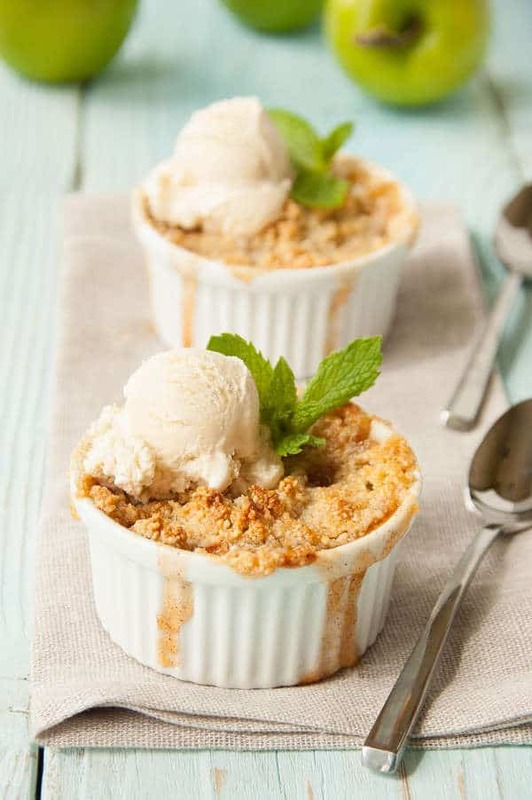 Do you prefer apple pie or apple crisp? Why? 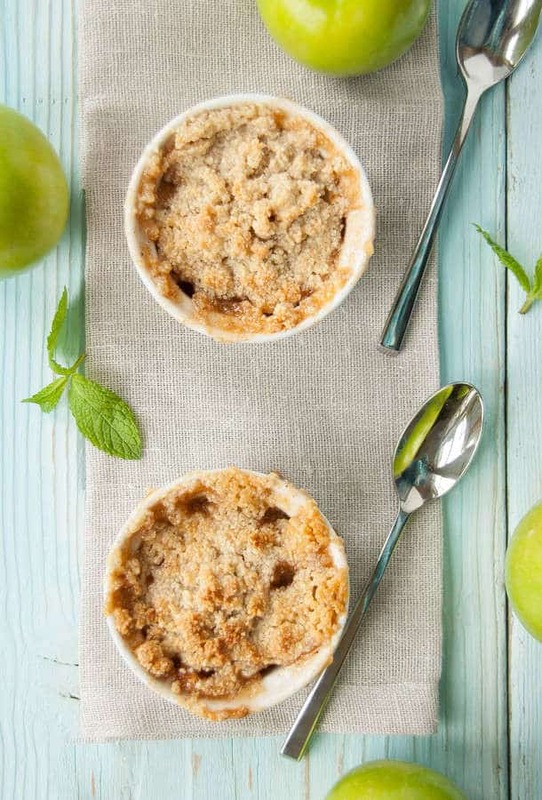 Share your thoughts below and enjoy this paleo apple crisp recipe! This paleo apple crisp is buttery, sweet, and crunchy. The arrowroot starch helps the cooked apples achieve a glossy, thick sauce while the honey sweetens it just enough. We served ours with vanilla ice cream and is was fantastic, but a coconut milk vanilla ice cream would be excellent as well. Preheat the oven to 350 degrees. Lightly grease 6 (½ C.) ramekins, place on a baking sheet, and set aside. Peel and core the apples and cut into a medium dice. Place diced apples in a large mixing bowl and toss with the juice of ½ a lemon. Sprinkle the arrowroot starch, nutmeg, and cinnamon over the apples and toss well to coat. Add the ½ C. honey to the apples and toss to coat. Divide the apple mixture between prepared ramekins, packing the apples down as needed. 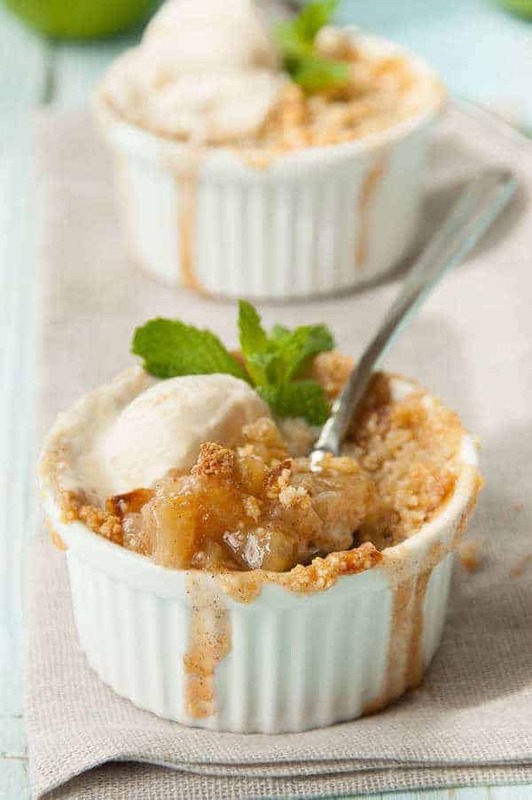 Place 1 teaspoon of butter on top of each apple filled dish and top each teaspoon of butter with 1 teaspoon of honey. Bake in preheated oven for 32 minutes. Place the almond flour, salt, and cinnamon in a mixing bowl and stir to combine. Cut the cold butter into very small cubes and add to almond flour. Cut the butter cubes into flour until they resemble coarse crumbs. Drizzle the 2 ½ T. of honey over the mixture and work it in with your fingers. Mixture should form very large clumps. When the apples have baked for about 32 minutes, remove them from the oven and divide the almond mixture evenly over the tops of each ramekin. Place the dishes back in the oven on the top rack and bake for an additional 10-12 minutes, or until the topping starts to turn lightly brown and the filling is bubbling. Serve with a vanilla coconut milk ice cream. Thanks for the recipe. Being Celiac I eat grain, dairy & refined sugar free so I definitely would sub in coconut oil for the butter and even trade out some of the honey for organic maple syrup. . Can’t wait to make this tomorrow. I hope it worked out for you. I would love to know how they turned out! 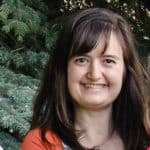 Hi, just a question, I thought a true paleo diet did not include butter? ,grass fed or otherwise??? That’s one of those gray areas. I personally think it’s fine, but you could replace it with ghee, coconut butter or coconut oil. This looks delicious!! I would tweak a couple things to make it work for me (I’m following a Trim Healthy Mama way of eating), but most Paleo recipes are a great starting point! Oh, man. I absolutely cannot wait to try this out because it looks and sounds AMAZINGLY delicious and perfect for a hot summer’s day! Apple crisps make me think of the summers when I was a kid, and I love the idea of updating the recipe to make it a bit healthier and paleo-friendly, too! Glad you like our recipe! Let us know how it goes after you have tried it! I prefer apple crisp because of the texture. I know there is a yummy gummy texture on the underside of the pie (I like that too) but the crunchy in the smooth is just as good and it seems you can be much more creative when making a crisp. I’ve been hearing about this Paleo diet–something else I guess I need to research. I am a big think tank. It’s so difficult to change your lifestyle unless you are around others emulating what you would like to do. AND to live near the resources to be able to buy “grass-fed butter” Thanksfor the recipe. This recipe looks amazing! Can’t wait to try it!! !